Success starts when you believe in yourself and you do what you need to do to succeed. 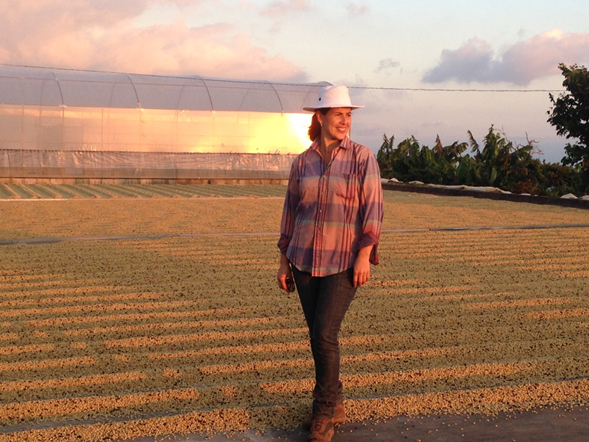 Unfortunately, women - in particular in the coffee industry - tend to sabotage their own success even before they start! Women need to remove from their thinking: “I am not ready to do that” or ”I will do that when I’m better prepared”. Modesty and perfection may seem minor behavioral patterns, but for most women the smallest things can often make the biggest difference from reaching success. “Gender equality is more than a goal in itself. It is a precondition for meeting the challenge of reducing poverty, promoting sustainable development and building good governance”. By Kofi Annan, Former General Secretary, United States. So the question is: can the coffee industry make a difference in the elimination of gender based on equity? Absolutely, it can! When everything seems desperate to women, nothing can feel certain. 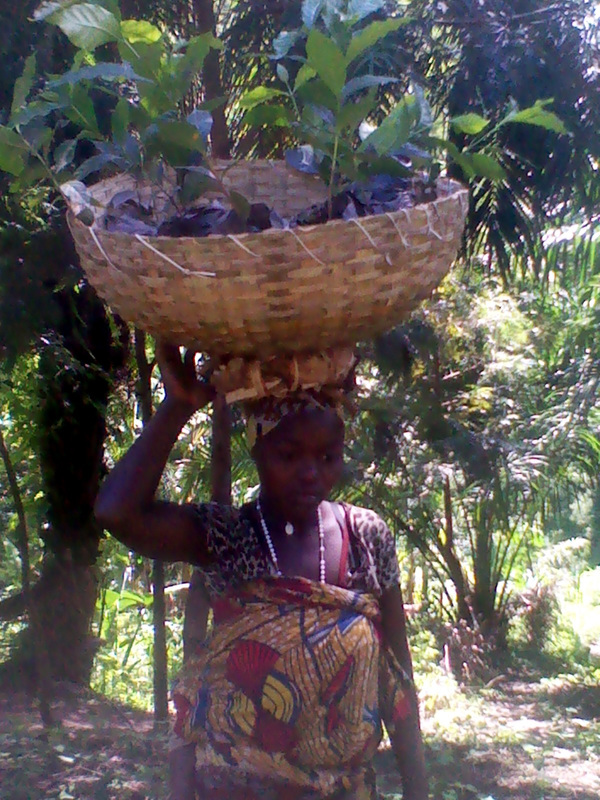 We have seen women coffee farmers stand up for themselves and see changes in small ways which bring about big outcomes. A vivid example is one of the Burundian women in coffee industry (IWCA-BURUNDI Chapter member) named Mawazo who got a bonus last year from the sale of her coffee. Her cherries participated in the competition of Cup of Excellence 2014 and were among the lots that were selected among the winners. 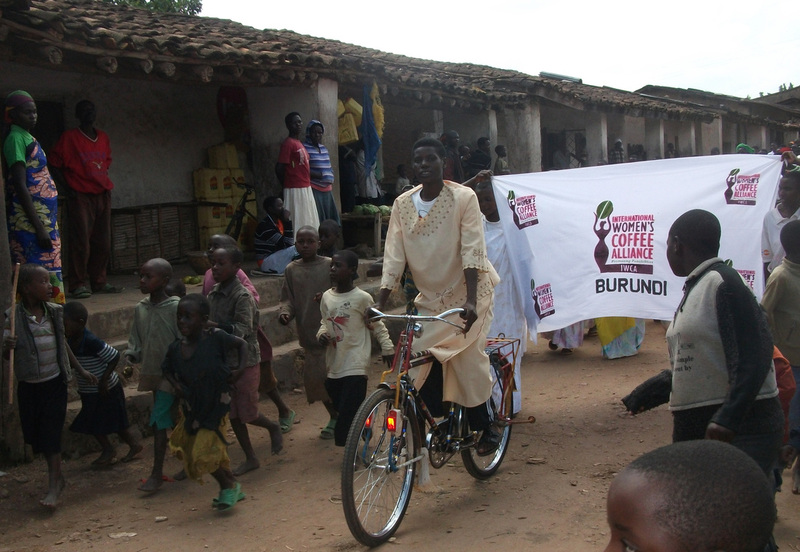 This special woman in the coffee industry, Mawazo, used her bonus from the sale of coffee to purchase a bicycle in order to support her family. She said: “First of all, I bought a bicycle so that I bring easily my cherries to the washing station, and secondly, if one of the family members falls sick, she/he can get transportation in order to go to the hospital”. Women all over the world need to stop making matter worse for themselves. Instead, they need to participate. And stay in the game. Make decisions, make errors, make changes. Exercise resilience. Love. Work. Play. Enjoy, and cry bitter tears. That’s what life is all about. We just need to know and understand that things can and will get better. In the heart of coffee growing region county of Murang'a (Kenya), there is a big beautiful coffee plantation. This farm is owned by a very strong determined woman who took up the farm after the death of her husband. Mrs. Claire Dusabe Nsanzimana came to Kenya from Rwanda in 1995 with her father. She finished only a year in the university before dropping out. 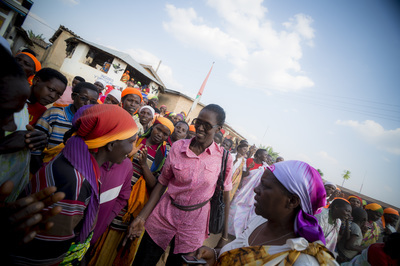 This is where she met her husband, who worked as a manager in a flower company in the Rift Valley part of Kenya. In 2001 they migrated to Nairobi with their children. Here, in the capital city of Kenya, he was involved in an insurance business. Having been brought up on a coffee farm, he had a burning desire that led him to go back to what he was passionate about...coffee! Mr. Nsanzimana bought the Whitestone coffee estate which housed a large coffee plantation. He invested much in his coffee farm, but he was a happy farmer since the trees gave him good returns. Claire’s aspiration was to become an international diplomat. Therefore, she joined the Catholic University of East Africa in 2003 in order to obtain her degree and later, in 2008, she pursued her Master’s degree in International Relations and Peace Studies. In 2010, her husband became sick. His health deteriorated and he passed on in that same year. Life for Claire was never the same again. She had no clue in which direction to turn. She had no job, a big farm with no idea where to actually begin. The first big drop in production was experienced in 2011 by about 80%. This was a big blow for Claire, who was still mourning the death of her husband. But wait a minute…she was not willing to give in to the situation that was pulling her down, to a moment that was crushing and tearing her apart. Now, when I met Claire on June 16th 2015 she really inspired me by how patient she had been. She had to endure a tough transition from a pampered wife to a widow. She also had to endure the big financial fluctuations from their coffee farm and above all, coping in a foreign land among other tough moments. The Coffee Management Services is a body that is involved in offering farm management services to the coffee industry and it has really supported her to transform the coffee trees which had declined in production. 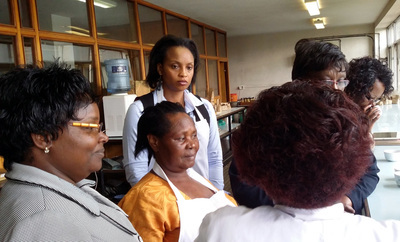 Joining the Alliance of Women in Coffee (AWIC) Kenya Chapter has also played a key role in Claire's journey in the World of coffee through training and development programmes. Believe me, Claire today is a very successful woman, who is determined and very passionate to change things around her. It has been said that what we were, what we have been, and what we intend to be, is shown more in endurance than any other virtue. She indeed remains a perfect example to the women around her. Her coffee trees have now begun to pick up in production again. This is expected to give even more returns this year compared to 2010....and all thanks to Claire's endurance and her strong personality! Raquel at her grandfather’s farm. 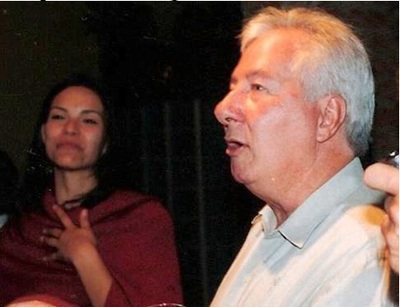 Raquel and her first boss, Dr. Maurício. 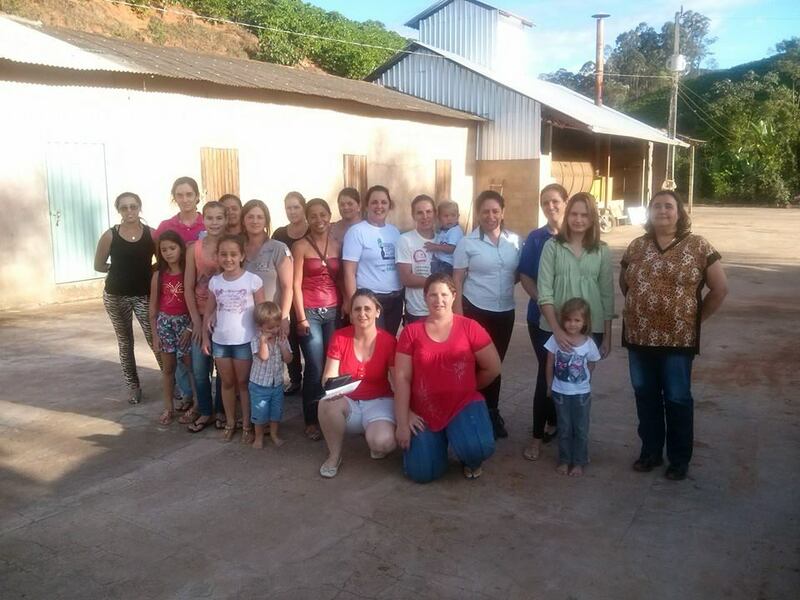 Raquel visiting a farm, when she was at the college. When I was a child, I spent my weekends at my grandfather's farm and one day while we were out to tour the orchard, I looked at the avocados and I said to my aunt, "I want an avocado" and she replied, "But they are green." But I was not satisfied with the answer. I insisted, replying: "But I want them...". Obviously she did not give me green avocados, but she tried to explain to me that there is a time when they would be riper and they would be delicious to eat. I grew up, I went to college and again my "impatience" could be noticed. My first boss in the company where I worked, Dr. Mauricio, used to ask me if I “was born ahead of time." He used to joke with me like that; such was my desire to make things happen fast, at the moment I wanted them to happen. Most of my life I have been such this girl: forward, quick, full of desire to be the "master of my time." Certainly, I suffered a lot because of that, but the best part was that I learned a lot too! How many things I did I learn from Dr. Mauricio and his white hair, especially to respect the wisdom of more experienced people! Today I have the maturity to look at things around me and understand whether they are ripe or not, if they are ready or not, and what will be the best time for things to happen, even if this is not “when” I want it to happen. In projects related to coffee that I've been working on, I have patiently observed my time, but also the time of others. Even as a woman, mother, professional involved in various activities, people sometimes ask me if I like to rush a lot. I learned to say, "No, this is just my rhythm." As I observe, I practice patience and let things happen at the right time, when they have to! As a teacher, I notice that each student also has their pace. Some will find their way and develop in a few years, others may take a lifetime. What makes me go ahead and want to teach them is the maturity which is coming through the years, and showing me that everything and everyone has their own time! Motivation is the force or engine that thrusts us into making our dreams come true, personally as well as professionally. It is that which helps us to get up, move forward in difficult and hard times, when you feel you cannot take a further step, it is that spark that ignites the soul of our life and illuminates the path to success. In my life, I can say that motivation has been my support, the hand that holds me, my guardian angel who guides me in my development as a human being to become the woman I am today: a dreamer, a fighter, entrepreneur, always looking to achieve my goals and objectives, which at the beginning seemed unattainable, but not impossible. It is faith in you, no matter what others believe or think. We must remember that boundaries are within us; competition and struggle are within us. We must always be the best version of ourselves. It is important to understand that this world we live in needs people to work more and criticize less, build more and destroy less, promise less and solve more, expect less and give more. They must say “now” rather than “tomorrow”. It is only possible to move forward when one sees beyond the obstacles. One can only thrive when thinking big. And this can only be achieved when motivated. Motivation is what drives us to start and habit allows us to continue. Motivation can be reflected on anything that surrounds us. The important thing is to recognize our strengths and weaknesses, to love and respect ourselves the way we are and to work every day to be better without losing our essence. 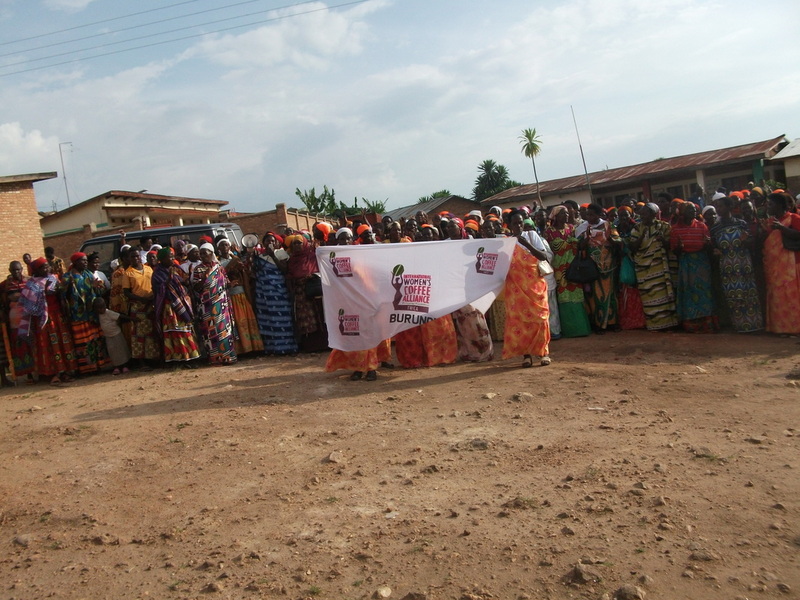 “Investing in women and girls has a multiplier effect on productivity and sustained economic growth. Investing in women is not only the right thing to do; it is the smart thing to do”. By Ban-Ki-Moon, General Secretary, United States. Around the world, women play a major role in the production of coffee. Despite this fact, women tend to have little control over the harvest proceeds. 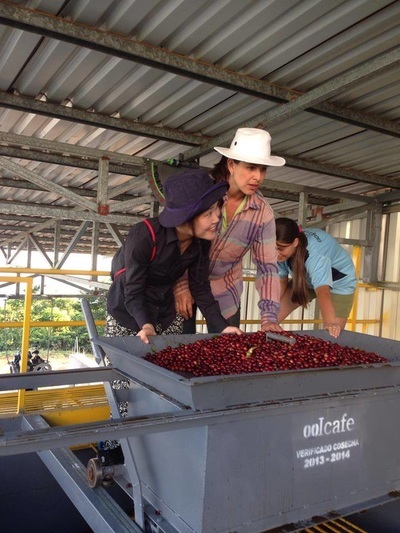 Women producers have little access to productive resources, including land, credit and inputs, and women’s roles in actual coffee marketing and trade in most countries is extremely limited. Women are often marginalized from the sector decision-making processes that affect them. Research shows that increased access to resources for women, particularly in the agricultural industry, has great effects on education, health, nutrition as well as on poverty reduction. For women, - and thus also for families and communities – to thrive, barriers to women fulfilling their potential in the economic and commercial activities need to be overcome. Access to information, credit, infrastructures, and other business development services are required to ensure women’s involvement in decision-making processes. 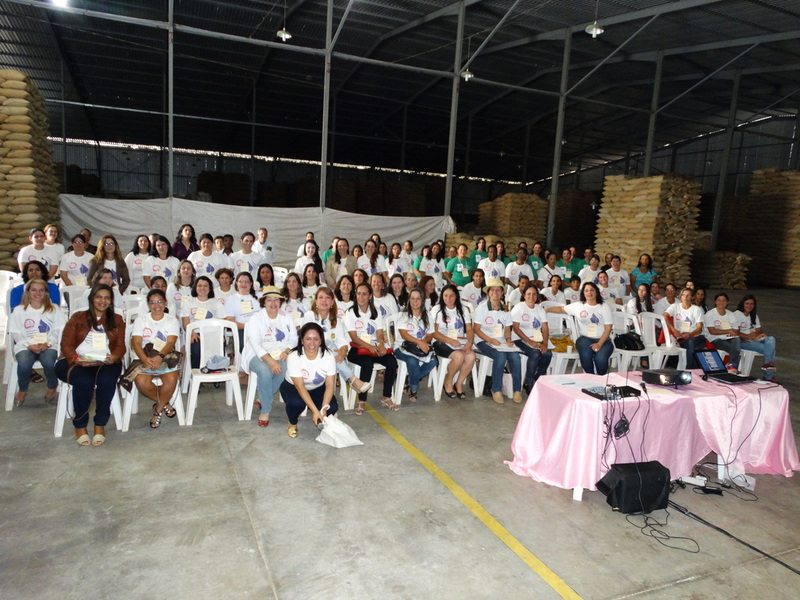 Awareness, training and networking are crucial to strengthen women’s voices in the coffee sector. 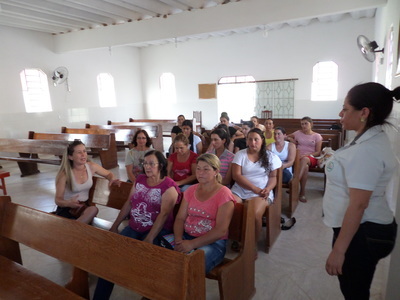 Perhaps the most opportune way to advance women and promote women’s rights in the coffee sector is through women’s associations, in which there is a joint agreement on objectives, where issues and matters of particular interest to women can be discussed freely, and where there is an absence of peer pressure. Many national women’s associations have emerged since 2002 in order to express what women have endured for a very long time, to awaken other women in the coffee industry to take a stand and fight for their rights for empowerment in the coffee industry. It is time that women get the recognition they deserve, especially after what they have endured for so many years in the coffee industry. 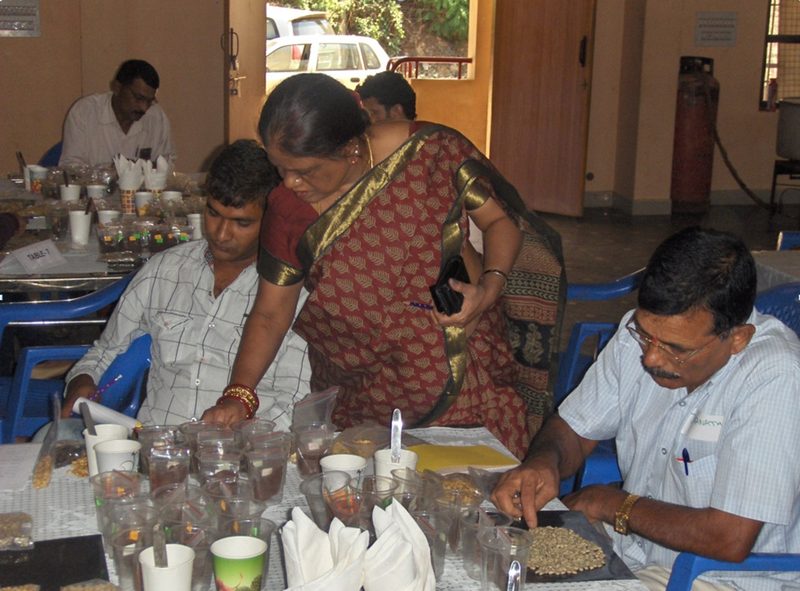 It happened quite by chance that Ms Renuka Gangadhar came into the world of coffee. 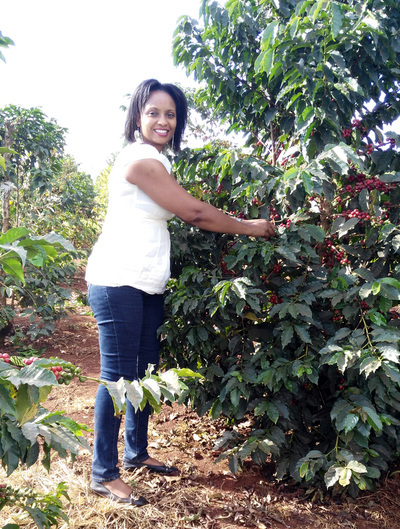 As a grade 8 student, she was introduced to coffee by a trainee teacher who brought into the classroom a coffee plant, a coffee maker and some coffee berries to showcase the coffee making process. The interaction piqued her curiosity and the bright young Renuka had a lot of questions to ask! It was only many years later, after she had completed her masters in the field of nutrition and had worked for a few years in education and primary health care that an advertisement in the newspaper brought her into contact with the Coffee Board of India. 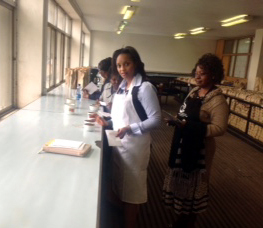 Sensory evaluation had already been a part of her training and Renuka got the job of a coffee taster! Through the Coffee Board, Renuka was part of the team that travelled across 8 countries sponsored by the International Trade Centre, visiting Croydon, Oslo, and finally training at Hamburg. 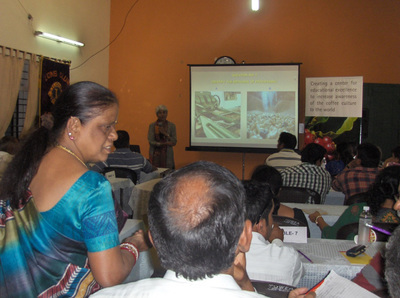 She travelled to the coffee growing regions in India and was part of the technical committee that would advise the growers on how to dry, how to store, cure and other aspects along coffee value chain. Those were the days in which all growers sold all their produce to the Coffee Board and so it was up to the Coffee Board to ensure that each grade of coffee was uniformly managed, since produce from several coffee farms would come to the Coffee Board to categorize and sell in the world market. When India liberalized coffee in 1995, it was a historic moment that changed the way coffee was sold from the country. 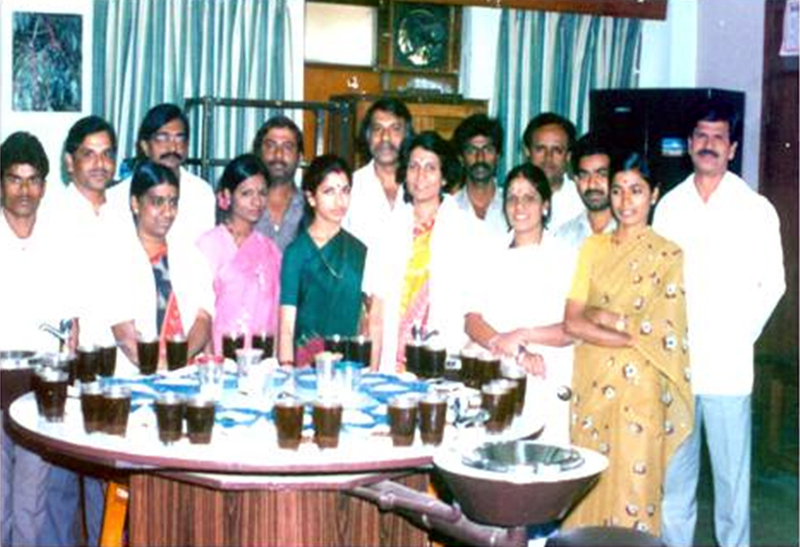 Mrs Sunalini Menon started Coffee Lab and Renuka became an integral part of the Coffee Lab team. Illycaffè’s Università del Caffè holds a special place in the memory for Renuka. It had illycaffè and Coffee Lab partnering to educate growers across Chikmagalur, Hassan, Coorg Sakleshpur etc. 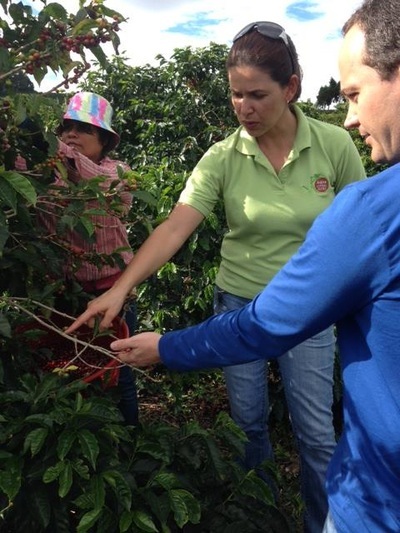 about producing coffee that would meet international standards. It was a mobile classroom and all training material and the trainers travelled extensively, booking halls, providing training in batches, analysing samples and giving advice on what can be done differently. Coffee Lab’s contribution to the world of Indian coffee is monumental and Renuka has been part of it from the start, being involved in coffee grading, cupping and helping to select the right coffee to be sent to coffee giants across the world. The world of Indian coffee has been revolutionized, world markets and tastes in coffee have changed and the domestic coffee market has transformed. Through all these changes, Renuka’s career and contributions to coffee have endured for 35 years. In the fickle world that we live today, few people can say, like Renuka can, that I have been part of this aromatic world for more than 3 decades! 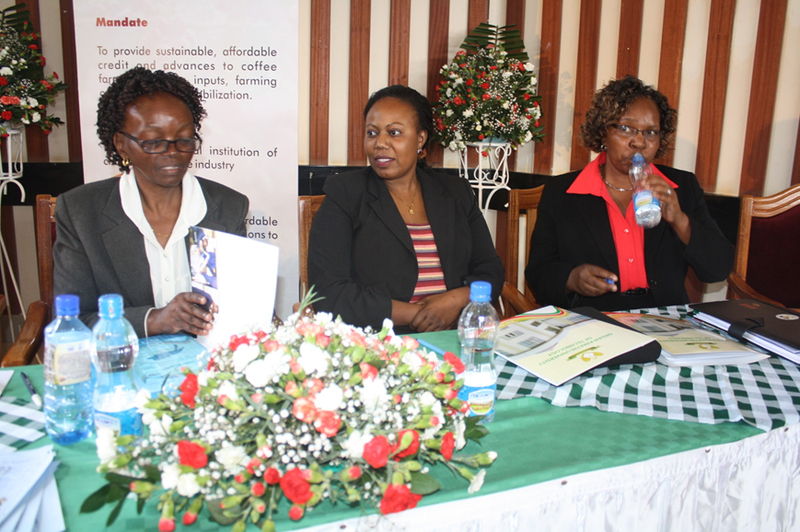 Some of the most successful Women in Kenya in big leadership positions. Even the most successful people in the world once had a beginning. They all had to undergo challenges during their lifetime. They had opportunities just like everyone else. The difference is how they handled each situation as it unfolded. Successful people put their best skills, thoughts and engage themselves with abundant commitment while still being consistent. They are passionate and believe in themselves. Life is composed of different packages. Harmonizing what surrounds us is key. Our strength should be dedicated to our family, job, environment and our social life. Each component of life really matters. Setting priorities with a proactive mindset will lead us to a happy coffee community in the future. “My achievement” and “our achievement” means little if it does not impact the people around us. For a successful tomorrow, we should be accountable of our actions, bearing in mind that each action that we take today will always be reflected tomorrow. Women play a critical role in every community. 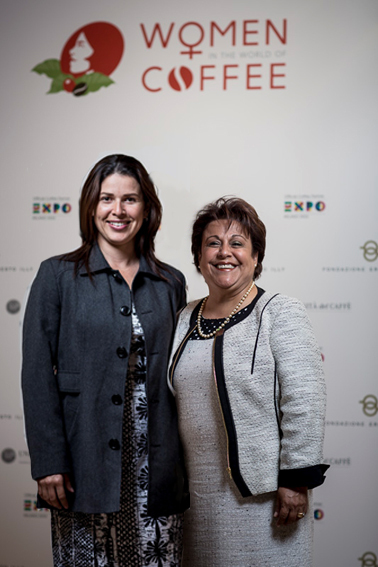 Supporting the vision of women can bring about great success. Women know how to take care of their families thus resulting to a successful nation. The lasting value of our future depends upon a successful solid foundation which comes along with failures, hardships and disappointments. Not a single smooth road that leads to success exists, thus we should be ready for tough moments towards success! Just to quote Caroline Cummings, "The comfort zone is a nice place, but nothing grows there. Take the leap today....”! Edith grew up under the Huancayo sky, in the province of Junín in Peru. Edith and her brother Ivan were very much loved by their parents and teachers, but special attention was paid to Edith who was born with a heart condition. In order to find a cure for Edith’s ailment, Elsa, Edith's mother and Edith travelled to Lima, to the capital city, where Edith was admitted and operated on in the “Hospital del Niño”. She and her mother stayed in the hospital for 2 months where Elsa took care of her daughter Edith. 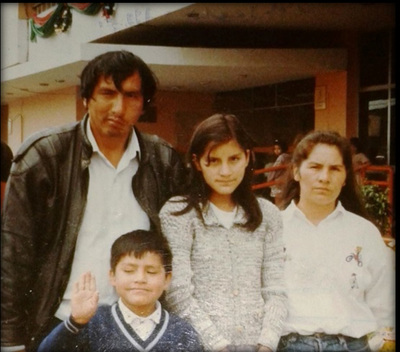 On Christmas day, Edith was discharged from the hospital and her father Mario and brother Ivan traveled to Lima to take them back home. When Edith was 14 her life and that of her family had a radical change: her father and uncle travelling to their hometown in a van got into a terrible road accident that would end up taking both their lives. Over time, Edith’s mom had to make a decision and chose to travel to Satipo in Junin to buy a coffee farm. Elsa lived on a coffee farm as a child and now she would return to work growing coffee again - a life she enjoyed. The trips were constant, going from Huancayo to Satipo became a common daily event, but Elsa worked the land and cared for her children. Edith decided to study engineering in the food industries in the National University of Central Peru. She was to leave her mother alone with all the duties of managing a coffee farm. It was difficult to leave her family and it took a lot of strength to do so. 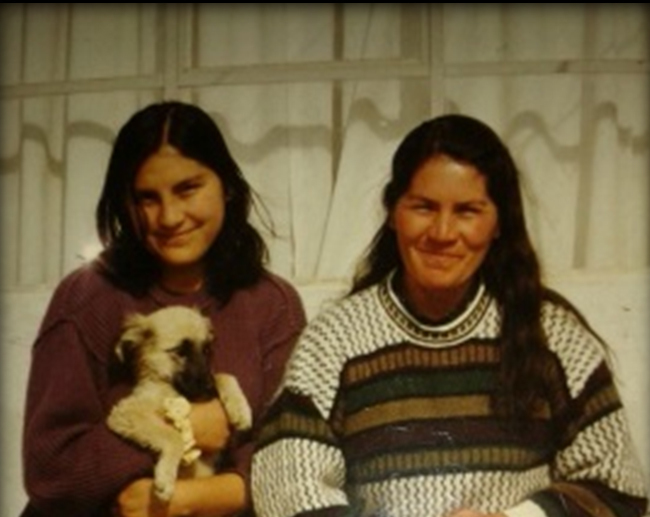 Close to graduation day Edith was told the worse news that a daughter could ever hear: on one of her usual trips to the coffee farm, Elsa lost her life – just as her father Mario had – in a road accident travelling by bus home. There was no graduation party for Edith, just sadness and isolation for what was the most shocking and saddest moment of her life. Two years had passed since the passing away of her mother when Edith decided to travel to Satipo - just to verify that workers were cutting the weeds and keeping the coffee farm in order. On those trips, Edith’s love for coffee was growing stronger and stronger, slowly conquering her. Every day she was on the coffee farm, Edith would learn new things – her eyes were opening to a world she only knew on a very superficial level. After her adversity, something changed in Edith. She does not know how she found the strength and energy to move forward, but it was her brother that helped her stop mourning and move forward. Edith was also indignant by the mistreatment of the coffee producers by the coffee buyers. She thought she could do something different, make a change, but she had no support. She found the strength to travel to Lima and looked for training courses in coffee. 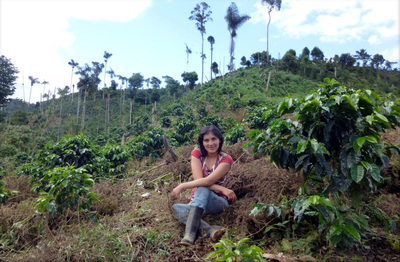 She lived alone at the beginning, but thanks to the scholarship program that she won which supported women entrepreneurs, Edith was in contact with people who understood coffee and learned what she had to do to make sure her mother’s coffee farm produced specialty coffee. She decided to call her coffee farm “Tasta” in honor of her mother's hometown, Tastapampa. 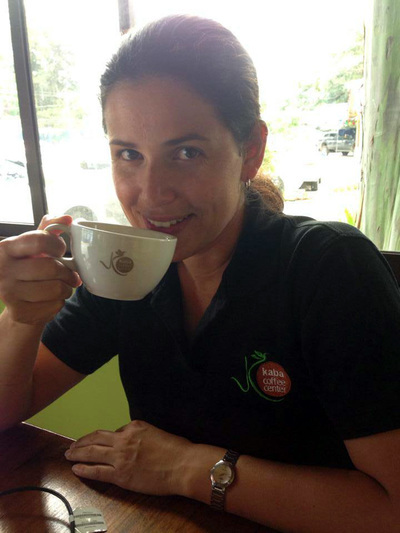 Edith is now one of the most requested coffee producers; her coffee is sold in cafes and gourmet restaurants. “Tasta” also grows other crops now: passion fruit, pituca, yuca, banana…there is even a fish hatchery. Fifteen people with their families work under her charge. Edith's desire is to empower local women and be an example of how taking care of a farm also means taking care of the people who work it. Edith hopes that what she is doing is making her parents proud of her. I’m pretty confident that they are indeed proud of their little Edith.